I wasn’t going to post this until a package arrived at Kenny and Beth’s. I mailed the package yesterday. Today, I noticed that I LEFT A 4 OUT OF THE MAILING ADDRESS after I had glibly, assuredly refused delivery confirmation and insurance, trusting the Post Office to get it to the address as they always seem to do in the U.S. I failed to recognize the culpability of the sender. Sigh. Here’s the story of Cynthia’s spoon. Beth, if you have to read it from here and not from the package, at least know that it was for you all along. Once upon a time, a little girl named Cynthia was born. Cynthia arrived on a hot August day in Texas, a day so hot that no birds sang and no water ran. In fact, no one did anything. Two spirits watched as Cynthia was born, a bird spirit named Cheepy and a Water spirit named Burble. Without birds to watch and water to manage, neither one had much to do to keep them amused. However, in among the rocks of the dry stream where Burble kept her treasures, was a small silver spoon, a tiny bit Cheep and a little bit Burbled. Cheepy charmed the spoon so that every time it would touch the lips of a little girl, the birds would sing in Texas and the girl with the spoon would know what was happening. Well, at least she would know who had a new nest and where the owl was, the kind of things that matter to birds. Burble charmed the spoon so that every time it was held by a little girl’s hand, clear cool water would fill the Texas creeks and wash over the treasures hidden among the rocks. Cheepy and Burble talked all August about this magical spoon, wondering if it worked. They needed a little girl to try it out on. August passed, thankfully and in September (because no one does anything in Texas in August), Cheepy and Burble left the spoon on Cynthia’s front doorstep for Cynthia’s mother to find it. Cynthia grew up to be an amazing woman, with news that no one else ever had. She was a favorite guest at cocktail and dinner parties. And, the full creeks brought her many treasures. Cynthia held swimming parties everywhere she went. But of all her treasures, her little silver spoon was her very favorite. I found this spoon of Cynthia’s among the rocks of a dry creek bed and a little bird told me the story. Last night as I held the spoon it rained and rained and the rain filled our creek to over flowing. I wonder what might happen if Olive tested it. Or Cora. Or maybe even you? Sorry, Kenny. It only works in a little girl’s hand and you don’t qualify. On Sunday, Eric and I went to Ranger Creek Brewstillery to help them label this month’s barrel of small batch bourbon, called Ranger .36. Each month they bottle a barrel which is approximately 70 cases of small bottles and invite 12 people to come help lable it. The lables have the batch number, bottle number, aging season and time hand written on them. I didn’t number labels. They are very careful not to duplicate a bottle number. I could picture the person who would check the liquor store labels, looking carefully for the right bottle number. Not. But they do go into the cases consecutively, so the stocker would know. I picked the easiest label to align, the seal label that goes over the cork and extends do the sides of the neck. 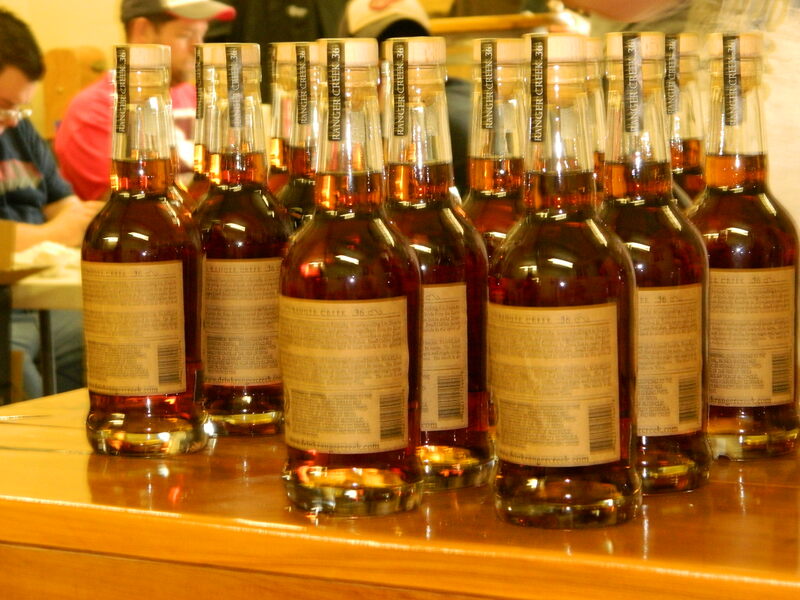 Bourbon is any liquor that is at least 51% corn and aged in new charred oak barrels. After the barrels are used once for bourbon, they go on to have other useful lives, aging scotch (or a version of Scotch that doesn’t come from Scotland and so cannot be called Scotch). Ranger Creek Bourbon is a really well-crafted bourbon, sweet with honey overtones (or that’s what it was like to me). It reminded me of Wild Turkey a bit. It’s worth trying a bottle. And if you want to put your hands on the process, you can sign up at Ranger Creek’s Website. But they don’t pre-announce. you have to be watching the website at the right time to find your chance. The founders are smart, careful, hardworking, hospitable and unflappable. They kept their day jobs as they build up their market. They have two employees, a brewer and somebody else, while they come in on the weekends and take care of the stuff that can wait. Like this bottling party. 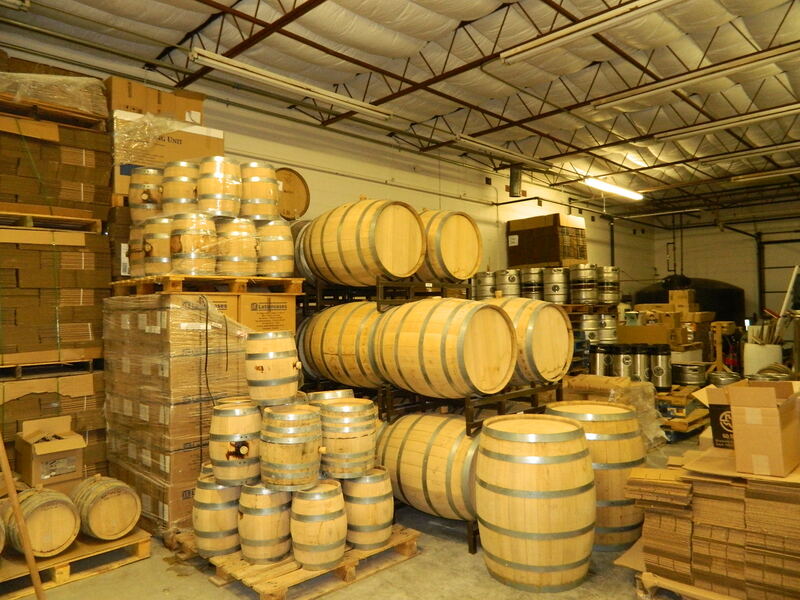 They started in 2010 and expect to have their big bourbon out of the aging casks in 2 years. Ranger Creek is a class operation with a few twists, like the grain smoker on the back lot made from a storage container. MMMM. Smells like barbecue. They’ll feed you pizza and whatever of their beers you care to drink. And you get to take home a bottle from that batch. 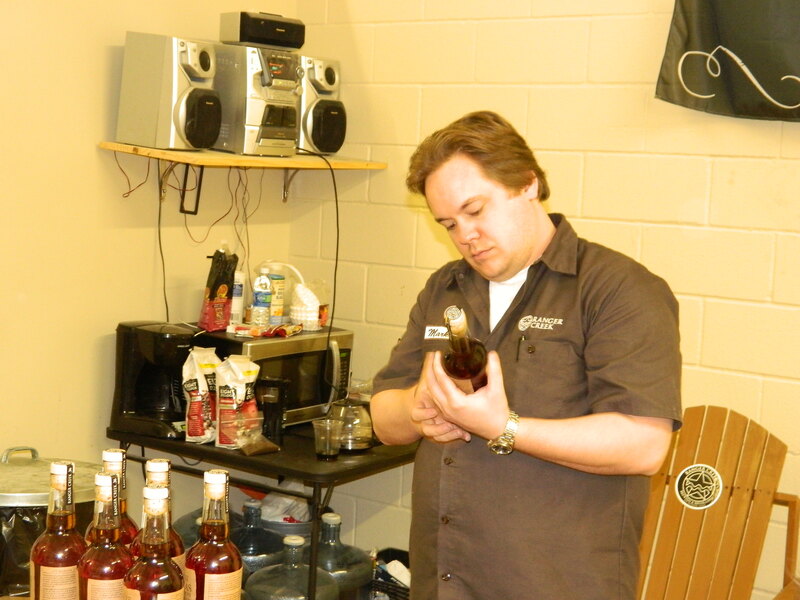 You can also find their bourbon at Specks, Gabriels and other liquor stores in San Antonio and Austin. Oh, I forgot to mention that their beers are also well-crafted. It’s a good time for all. Plus, you’l meet some interesting people. I bought a used grand piano on Craig’s list. Phew! What a lot of lessons. The one that I thought I was learning is that dedication to learning an instrument requires a substantial investment, in time and in the instrument itself. But that’s not what I learned. . . yet. I expect the obvious lesson to play out over the course of many years but the less obvious ones are front and center. 1. Trust in Allah but tie up your camel — I bought the piano from a man named Carlos. At least I think that’s his name. His address is 205 Northfield Dr. in Universal City. Carlos seemed to be a lovely man, very generous, very helpful and very straightforward. I took him at his word. Carlos lied to me. . . about the fact that he had the piano pedals attached in the past and that reattaching them would be routine. The pedals as well as other parts on this piano don’t belong on this piano. And in fact, they don’t work on this piano. Carlos lied to the piano movers when he omitted telling them that they would have to haul this grand piano up a full flight of stairs. I assume that he lied to me about pretty much everything else, except the fact that he was a failed mortgage banker. He isn’t returning my calls. Who’s surprised? 2. Frankenstein deserved love too. I could hate this piano because it isn’t what I wanted and it’s cobbled together out of loose parts that were lying around in some piano technician’s workshop. That technician took those spare parts and made a monster. I got the monster, a changeling. My piano technician said, “Dump this piano and get a good one but do it truthfully. Don’t do what Carlos did you you.” Right. I wouldn’t but I also wouldn’t buy a piano with a story like this one. Would you? He said, “The baby you have adopted is ugly and will never amount to anything in this world.” I am choosing to love this piano, because it’s the one that I have. (Thereby subverting desire — see below). I may never amount to anything in this world of piano playing either. So there. At least we’ll have each other. 3. There really are very few bargains left in the world. We all know so much about the value of things. It’s like the stock market. Most adjustments in value are made in micro-seconds. You get what you pay for, unless you go to Busse’s Flea Market. Then you get something else entirely. I’m not sure what. 4. Just because someone else has something so lovely that you desire it, doesn’t mean that you can or should have one too. Oooooh, this is BIG! I have a friend who is a beautiful, professional musician with a great singing voice who plays many instruments successfully. Yes, all those things, dammit! On top of all that, she has a piano so sweet that it will make you cry. It is a VERY expensive piano and one that I can’t keep my hands off of when I am in her house. The way the action works invites you to touch it. It’s a Claude Debussy piano. I went in search of that piano experience and settled on big sound. But then, all grand pianos have bigger sounds than spinets. And they direct the sound into the room through that open top. The piano I got is more of a Jerry Lee Lewis piano. 5. Precious things require special care. This piano isn’t a precious thing. See above. That means that anyone can play it. Kids can play it; people who don’t know what they’re doing can play it (we will stop short of setting drinks on it). And once the legs are stablized, I can sit on it, or lay across it, in a red dress. Not with the lovely piano above, but then my friend is tiny so maybe it’s not the same for her. My piano is not a worry; it’s a toy. So that’s my set of piano lessons. You’d think if I can learn these, I can learn to play even this piano better than I play today. I expect that’s true. But I need a working LOUD pedal. Surprised? Welcome to my new readers, young and brilliant! And a Happy 2012 to all of you but why don’t we have flying cars? I’ve noticed a personal behavior that I thought I’d share. My noticing is a product of memory and aging, which currently is amusing. I hope it remains so. My application is much broader. Yesterday, my husband lost his work cell phone. He searched in a mad Monday morning scramble, insisting that I must have moved it from the spinet, now in the entryway. Does this look too crowded to you? 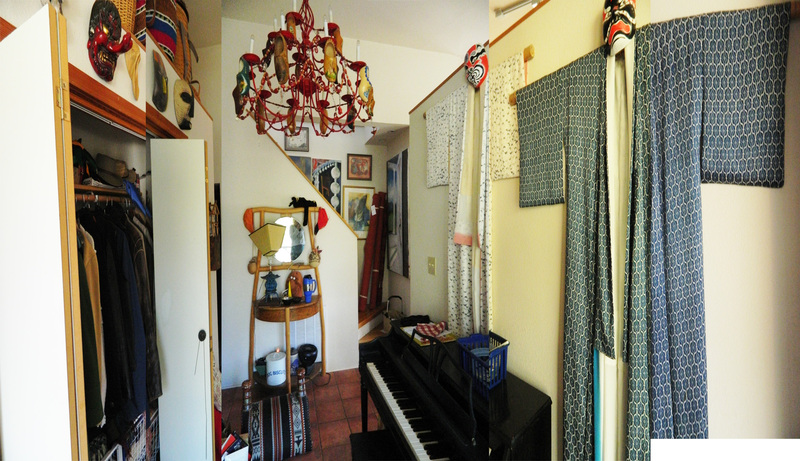 Backstory — part of the process of clearing out my parents’ house to prepare it for the next owners is gathering treasures and incorporating them into my already treasure-laden house. The melding causes some casting about (little letters), as we remove and restack that which we will keep. Anyway, back to the story. It was not the way to start a Monday, especially after a long weekend, which involved moving a small grand piano up a flight of stairs as well as moving all the other furniture about to make room for the new piano. Did you wonder why the spinet was in the entryway or did you imagine piano music from the moment you enter the house? We looked in all the normal places, the tops of flat surfaces, the bags of Goodwill items, pockets of coats, under pillows. He found it in the junk/tool drawer in the kitchen, next to the tape measure that we had used liberally over the weekend. Funny. Oh. I didn’t take it off the top of the spinet and put it there, but I’m tempted to the next time. Except I would have to leave myself an obvious note somewhere to remind me of my joke. And he wouldn’t think it’s funny. Which leads me back to the subject . . . I am developing two practices to make things easier to find. I feel as if I develop them now, they will serve me throughout the rest of my life. The first is to always put stuff in the same place, like parking your car in the same section of the parking lot at the grocery store — developing memory as habit. You can imagine how our housebasket turnover has messed with that practice. The other is casting about — scanning the room, turning my gaze to look upon flat surfaces for stuff that I might have set down when something else distracted me that I still need to remember something about. It’s amazing what else I find when I do that. Oh Yeah! That. I wanted to do something about that yesterday! Oh yeah, and that. I’ll take care of that right now. Great. Now, what was I doing. Cast about. Oh yeah! I think there’s a broader practice of Casting About (big C, big A) that’s fuel to creative practice as well. Casting about = unfocused wandering/wondering to see/absorb what is there as potential fuel, roaming without purpose; with wonder. I tell myself that’s why my house is full of visual stimulation. I can Cast About, while casting about. But it also means that there’s loads of visual distraction. Hmm. I’m not going to spoil the effect by posting a image here. Click the link to see some lovely visual essays. This is a site to get lost in. I loved her Dinner with a Stranger story. 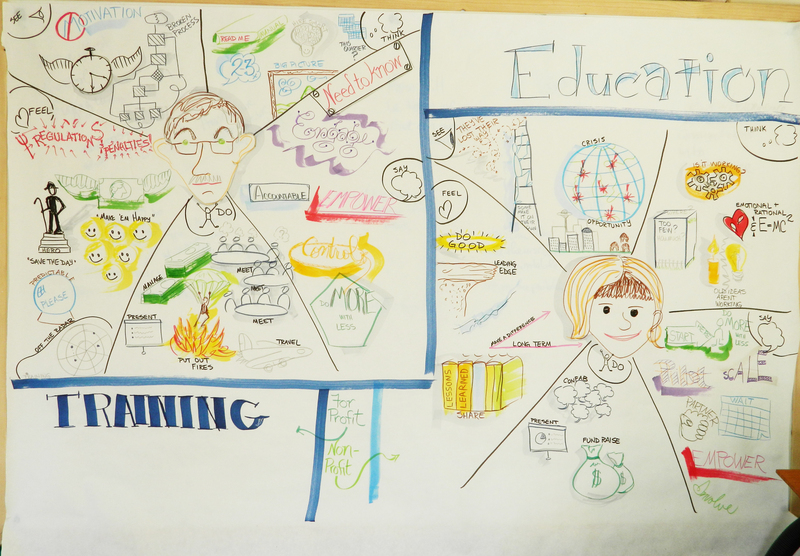 Do you think this is done with Prezi? I also had to add this one which I found about about through Anuschka’s new blog. Fantasy foodscapes. Wow.